Some time after I’ve eaten all of chef Javier Wong’s opening course of raw fish with lime juice, octopus and red onion – but before I’ve downed the closer’s last morsels of raw fish with orange juice, pecans and zucchini – I start reflexively rubbing my eyes. My wife, Sarah, who’s been matching me bite-for-bite here at Chez Wong, one of the iconic cevicherias of Lima, asks how I’m feeling. “Awesome,” I say, which is only barely a lie. We’re in Peru, and we’re having a fun time, and nothing – especially not my haywire train wreck of an immune system – is going to stop us. Any travelling parent might recognize the rubbing of eyes as the telltale sign that their tired kid’s had enough adventure for one day. My own mother knows better: “What have you been eating?” she’ll ask when she spots me doing this at home. And I’ll have to confess that I’ve been eating something high in citric acid, a component of sour foods like lemons, grapefruits and tomatoes that my stupid body is convinced is some kind of hostile pathogen. But here’s the thing: I really like the taste of sour things, and I especially like ceviche. Peru’s national dish of fresh, raw fish briefly marinated in citrus juice is a central pillar of the culinary boom that’s made coastal Lima one of the hottest food cities on the planet. And so, before we head up into the Andes – a cautionary-tale friend was once evacuated by helicopter from Machu Picchu, bursting with parasites from street ceviche she’d eaten in Cusco – Sarah and I are spending our two days in Lima eating as much ceviche as my steadfast regimen of antihistamines and hydrocortisone creams will allow. Javier Wong has been cooking out of his home in the gritty La Victoria neighbourhood for two decades. There’s no sign outside Chez Wong, but a doorman will know from looking at you why you’re on this street. Slim in his chef’s whites and with wisps of grey hair trailing out from his Kangol cap, Wong reaches into the chest fridge to haul out a seven-kilogram Pacific sole. We sip cold Heineken while he filets and skins the sole. Then, with a fresh knife and cutting board, he chops the meat into precise cubes – a ceviche innovation that, along with shorter acidification times, emerged in the 1970s from the commingling of Peruvian and Japanese techniques. The fish goes into a metal mixing bowl, along with a generous handful of salt and a full glass container of a slightly yellow-tinged liquid that makes my skin itch just seeing it: lime juice. Wong uses a wooden spoon to mix the fish with the lime juice, allowing the citric acid to denature the proteins in the sole. The flesh becomes firmer, more tender, with a beautiful semi-opaque whiteness at its edges. Our plate is quickly empty, save for the leftover liquid that Peruvians call leche de tigre, or “tiger’s milk.” Feeling bold – or foolish – I pick up the plate and slurp the cloudy juices. There’s a lingering sharpness from the red onion and hot pepper, but to a tongue that doesn’t get to experience citrus juices as often as regular mortals, the sensation of tanginess dominates. In a good way. After enjoying a modern ceviche at dinner – chopped scallops on the shell at Sophie Bistro in the Miraflores district, with aji limo pepper and a frothy cilantro emulsion – I awake only mildly worse for wear. “At least you didn’t need to sleep with socks on your hands this time,” Sarah jokes. My sensitivities have mellowed with age. We decide to push our luck with a prelunch pisco sour at the bar that perfected them in 1930. Eloy Cuadros has been working behind the caoba-wood bar at the Hotel Maury for 54 years. Pisco grape brandy and lime juice, made viscous by Cuadros’s vigorous shake with gum syrup, goes down easy at 10:30 a.m. We walk to the nearby Hotel Bolivar for a second round, and learn that in Lima, a double is called a “cathedral.” How elegant. We head south to Barranco, armed with the address of a new “sustainable fish” cevicheria that I’d seen tipped in a year-old travel story. Arriving at the unoccupied storefront, I learn from the hairdressers next door that we’re a few weeks too late: Apparently, the fish were more sustainable than the business model. Only in Lima can you ad-lib a meal-fail and end up at a joint run by Gaston Acurio. Fortunately, our driver has a backup plan: Avenida La Mar in Miraflores, the city’s veritable ceviche row. 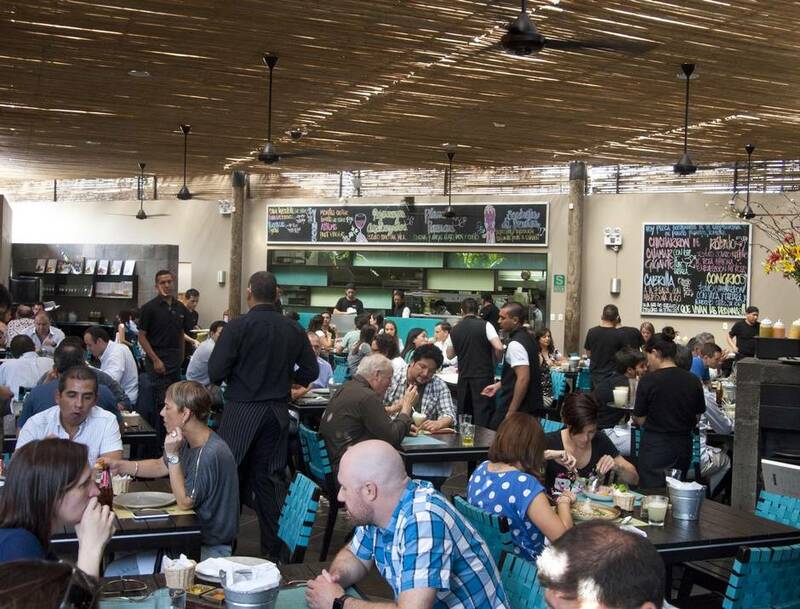 We score two counter seats at La Mar, a bamboo-roofed room accented with South Beach pinks and baby blues. Only in Lima can you ad-lib a meal-fail and end up at a joint run by Gaston Acurio, Peru’s most famous chef. Our prime seats are directly facing the ice bed, loaded with huge local fish such as congrio that stare back at us from perfectly clear eyes. It’s a good reminder that Sarah has conquered her own food limits since we met more than a decade ago. Back then, I didn’t eat tomatoes and she didn’t eat seafood. During one vacation, I hauled our family prawn traps from the cold waters off Vancouver Island, laden with sweet spot prawns that helped to bring her around. A crucial victory for a smitten island boy. The idea of us two travelling to Peru to eat citrus-marinated fish would have sounded damn unlikely a decade ago. Now Sarah’s the one gleefully ordering the mixed ceviche sampler of sea bass, mackerel, octopus, squid and tuna. “We use 40 kilos of limes each day,” says Bruno, the young chef who runs the ceviche-making brigade. On our way back to La Molina to pack our bags for the Andes, we stop off at one last cevicheria. It’s hard to throw in the towel, even if I’m starting to notice some red welts on my arms. Hey, there are always sock-mittens to fall back on. 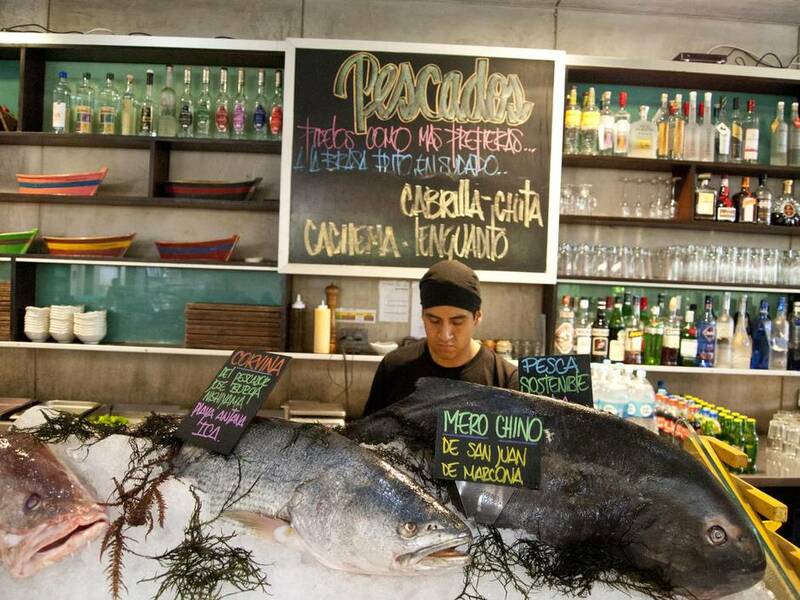 In the open-air courtyard of Pescados Capitales, Limenos linger over late lunches. We order one classic ceviche: Pacific sole bathed in lime juice, dotted with red onions, sweet potato and kernels of corn. To share. We say it together: No, senor. Air Canada rouge flies direct to Lima from Toronto.